During Winter, Capucine kept growing (No ? Yes ! 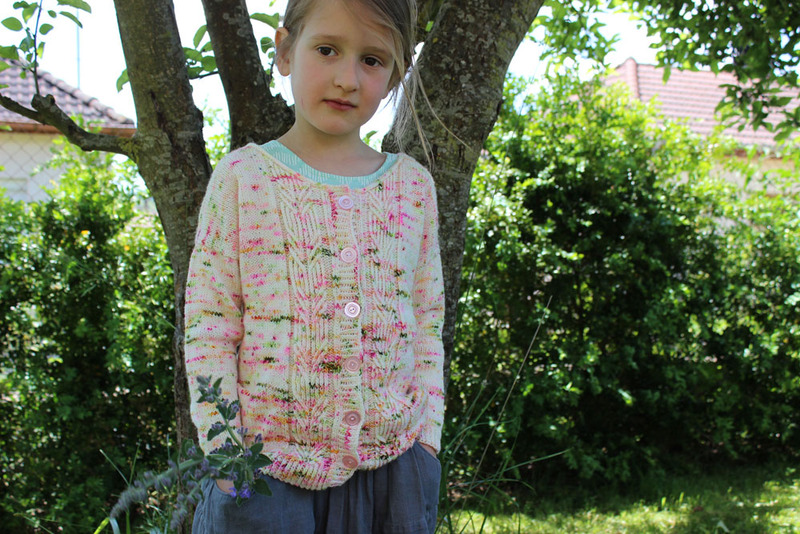 )… So, early in March, wanting to anticipate a little, I decide to knit her a new cardigan, one size bigger (8 yo for my 5-years-old girl…), in a thinner and lighter yarn to make a spring-summer cardi. Still rummaging though my long models-to-try-one-day list on Ravlery (it is so long, if you knew, and though, I “clean” it every so and then…), I choose to knit My Dear Watson, by Nadia. Another one of her pattern ? Yes ! Another one ! They are so nice and well written. Early April, working simultaneously on one of my sample (you will see it soon), I begun this lovely cardi. Everything went smoothly, a true happiness to knit. My only mod was to replace the neckband ribbing by an-I-cord. The collar is more scooped out, but for Spring and summer, I find it perfect. Capucinechose the buttons in my old buttons satsh and I must say the delicate pink looks so good on this cardi.